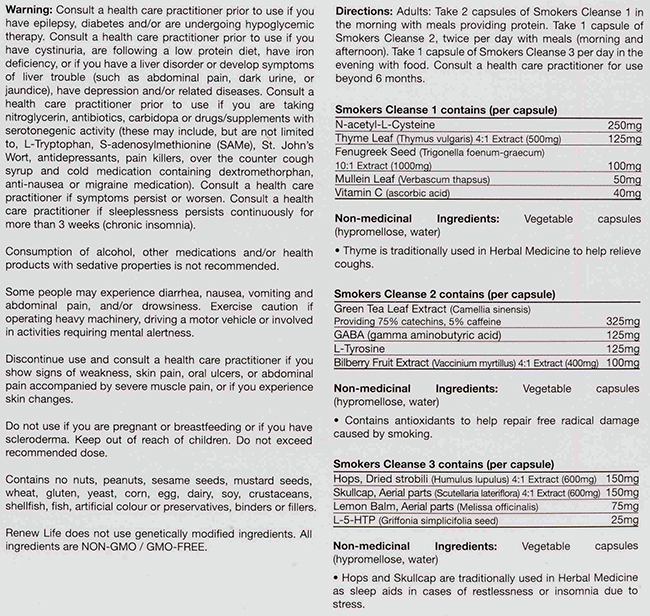 Smokers Cleanse is a 3 part program containing herbs, vitamins, and amino acids. All parts are delivered in vegetable capsules. Part 1 is a lung support formula that targets the respiratory system. Part 2 is a craving support formula. Part 3 is a stress relief formula. Smokers Cleanse works to help alleviate some of the most common ‘triggers’ that cause people to fail in their attempt to quit smoking. By helping reduce the likelihood of these problems, it helps make quitting easier. Smokers Cleanse also helps improve the overall health of the respiratory system and provides antioxidant support. 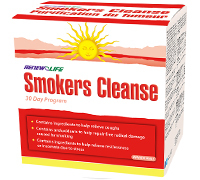 Smokers Cleanse is a 3-part program. Each part is formulated to reduce the impact of ‘triggers’ that can cause a person to start smoking again. Smokers Cleanse 1: Contains expectorants to help relieve the symptoms of bronchitis and catarrhs (inflammation of the mucus membranes) of the respiratory tract. It works to help expel mucous from the respiratory system, as well as soothe inflamed tissue and bronchial passages. Lung Support also contains powerful antioxidants that help to protect the respiratory system, allowing it to repair and rebuild faster. Smokers Cleanse 2: This formula works to reduce cravings. By using a therapeutic dose of green tea extract, cravings are significantly reduced. Green tea extract has been shown in clinical studies to have a positive impact in helping people quit smoking. Craving Support also contains the amino acids GABA and L-Tyrosine, which work to curb the effects nicotine addiction have on the brain. “Keeping the supply of GABA at high levels has the potential to reduce the pleasurable effects of smoking, in terms of duration and intensity – American College of Neuropsychopharmacology (ACNP) Annual Meeting”. Smokers Cleanse 3: This formula helps to promote restfulness and relaxation. This is very important as two common problems associated with quitting smoking are anxiety and trouble sleeping. Take 2 capsules of Smokers Cleanse 1 in the morning with meals providing protein. Take 1 capsule of Smokers Cleanse 2, twice per day with meals (morning and afternoon). Take 1 capsule of Smokers Cleanse 3 per day in the evening with food.